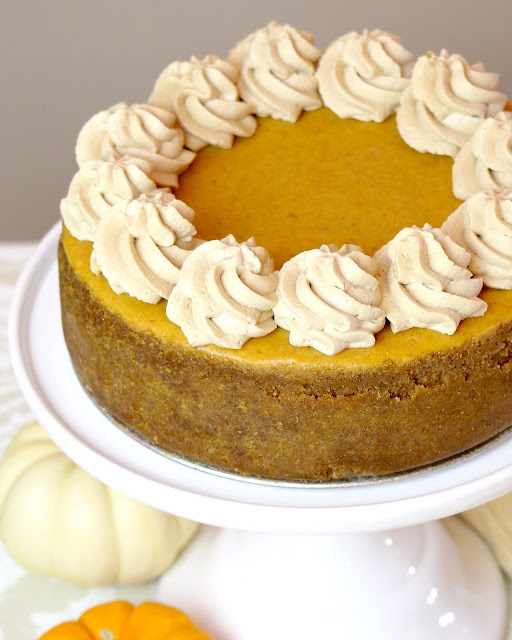 Ultra smooth, velvety, creamy cheesecake, with that hint of fall spice and pumpkin flavor. 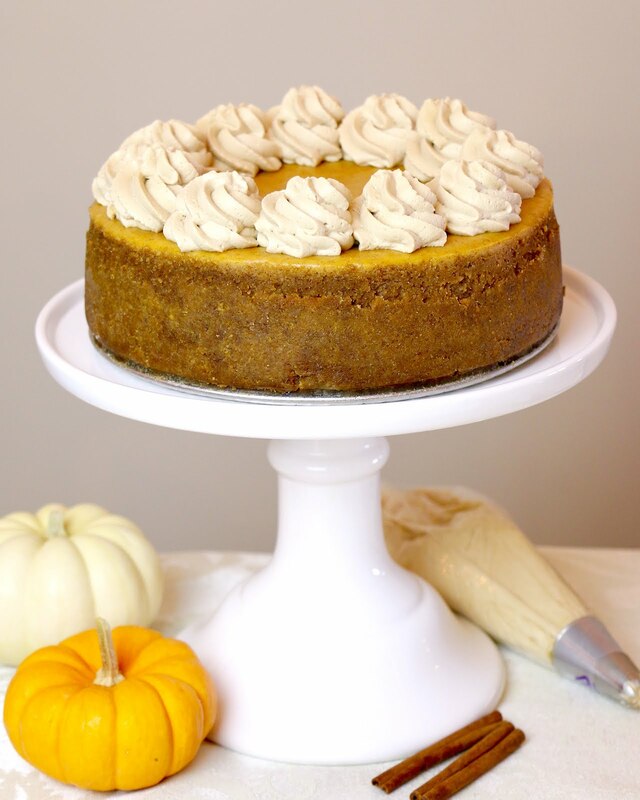 Stacked up high on top of a buttery, spiced graham cracker crust and finished off with light, fluffy swirls of homemade Maple Spiced Whipped Cream! This is my absolute favorite fall time dessert! 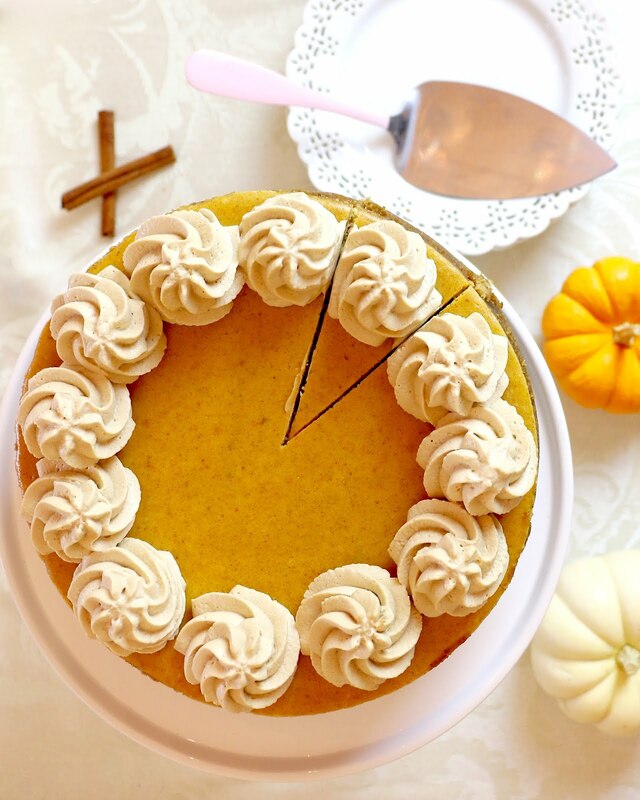 I wait all year to make it specially for Thanksgiving. 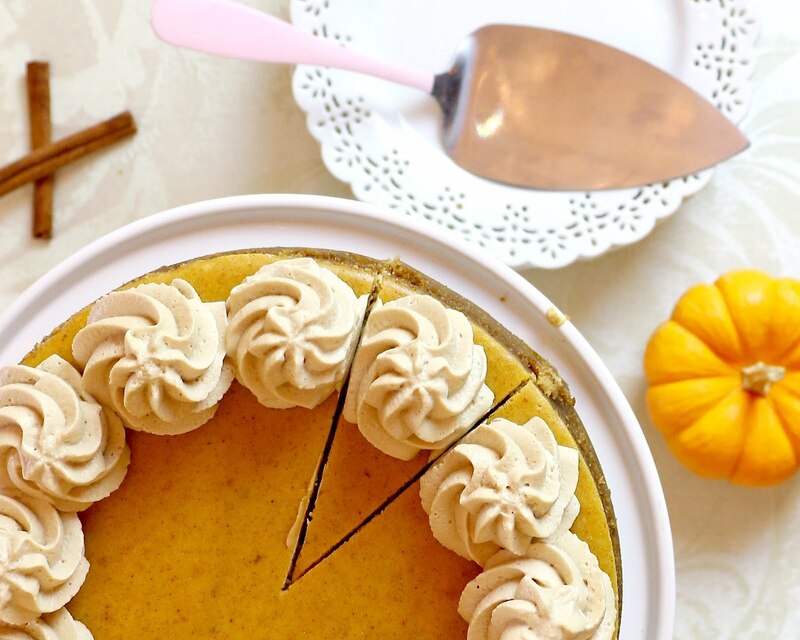 The crust is buttery, crunchy and thick, pairing perfectly with the smooth pumpkin spiced cheesecake. And those swirls of homemade sweetened whipped cream on top, pull it all together, for the perfect slice. Silky pumpkin cream cheese flavor, a little buttery crunch from the crust, and that creamy sweet spiced whipped cream on top. 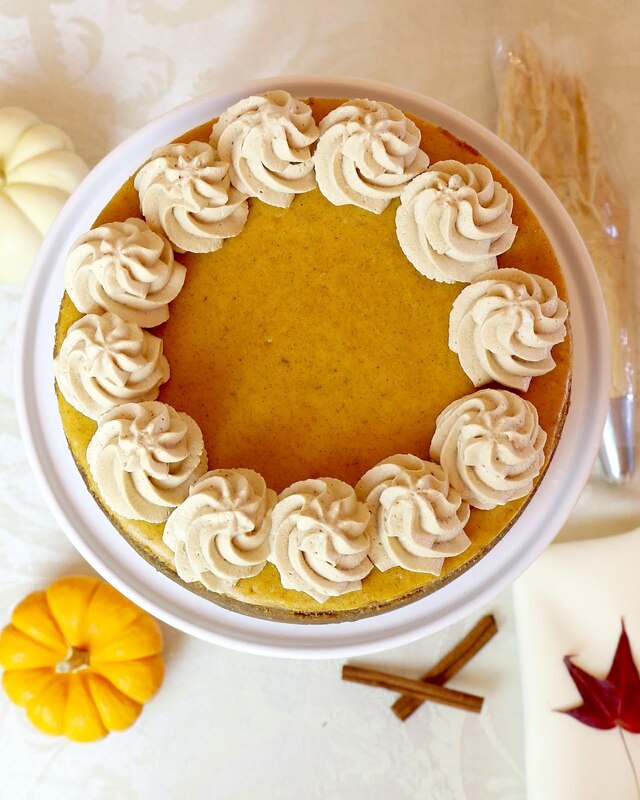 With a cup of coffee, this makes the perfect indulgence for Thanksgiving dessert, or any fall dessert. 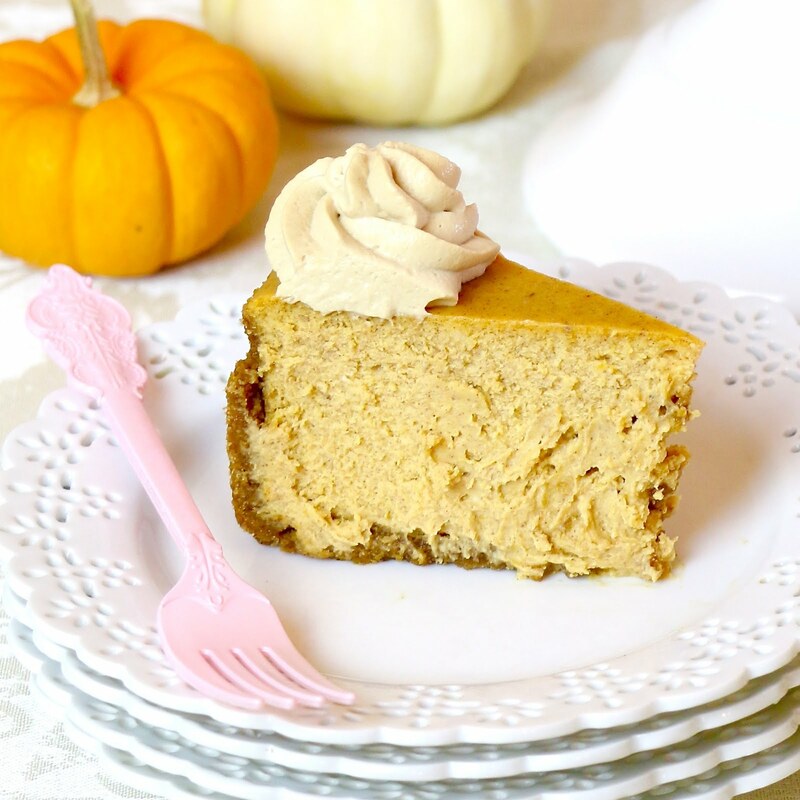 If you're like me and traditional pumpkin pie just isn't your thing, you will love this fun twist on the classic. 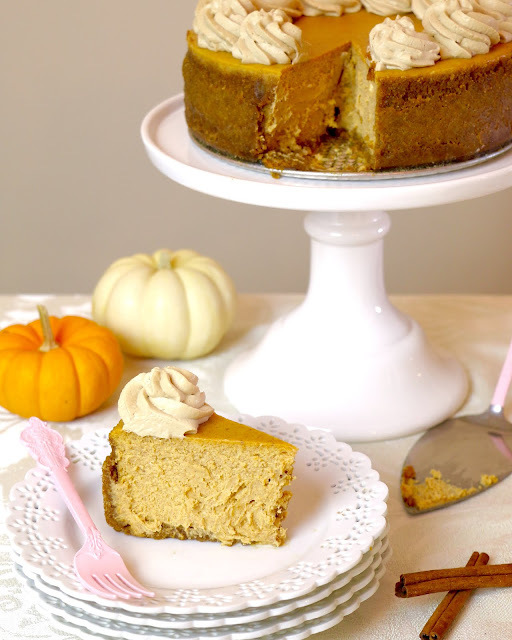 To me this crust is a zillion times better that pie crust, and the cheesecake filling is like regular pumpkin pie filling with a sweet, thick, tangy richness added to it. And of course, this whipped cream, well that stuff in the can doesn't even compare! 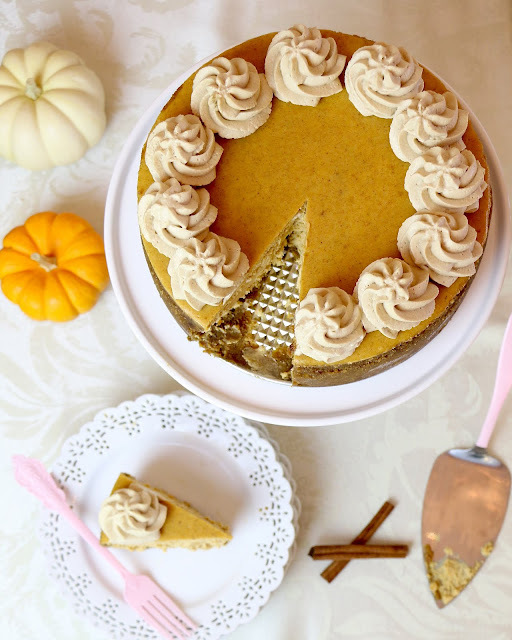 I love a thick, tall, creamy, slice, that you can sink your fork into, making sure to get a little of everything in each bite. *Note: you can also sub a tub of frozen thawed whipped topping and gently fold in maple and spices. Preheat oven to 325 degrees F. Spray the bottom and sides of a 9-10 inch springform pan, with non-stick cooking spray and wrap the bottom and up the sides with heavy duty foil. In a small bowl combine crumbs, sugar, and melted butter. Press into bottom of pan using the bottom of a glass to pack it down tightly and evenly. Set aside. 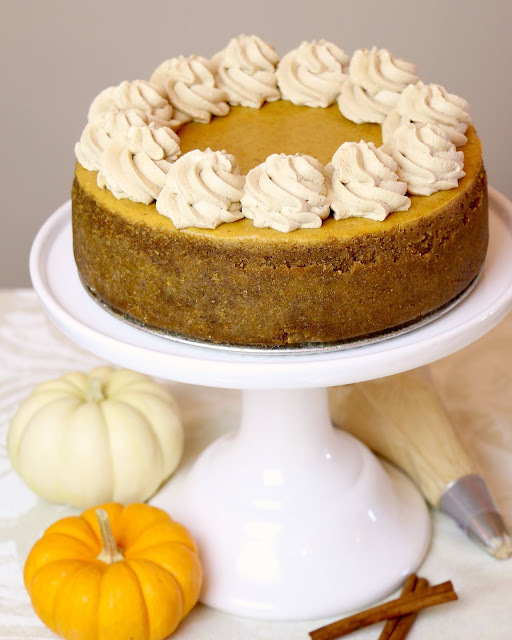 Using an electric mixer, beat the cream cheese on medium speed until smooth and creamy. Reduce the speed to low and gradually beat in the sugars. Scrape down sides and bottom of bowl to make sure everything is incorporated. 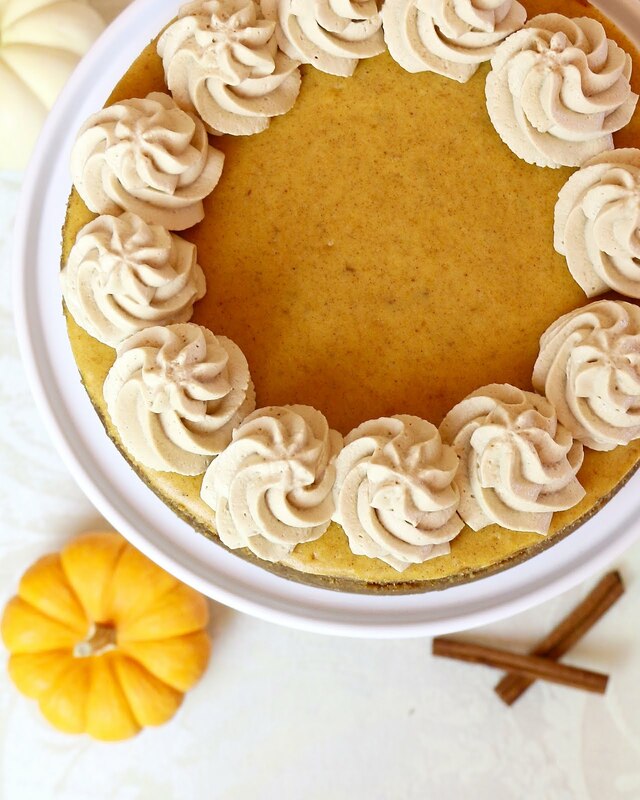 On low speed, beat in the pumpkin and sour cream. Beat in the egg one at a time. Add the vanilla, spice and flour just until incorporated. Do not over beat, this incorporates too much air into the batter, which can cause the cheesecake to rise and then sink during baking. Pour cheesecake filling evenly over prepared crust. Place the pan into a larger pan or roasting pan and add boiling water into the larger pan so it comes about halfway up the springform pan. Bake for about 1 hour. Do not over bake. Cheesecake will be done when the center is still a little jiggly and the edges are lightly golden brown. Once cheesecake is done baking, to avoid sinking or cracking on top, you must let it sit in the warm oven to rest, with the heat turned off and the oven door slightly opened just a crack, for about 1 more hour after baking. The center will continue to cook from the residual heat and set as it cools down. After the hour of resting in the oven, remove cheesecake from oven and cool completely on a wire rack on the counter top. Once cheesecake is completely cooled, refrigerate, uncovered, at least 8 hours or overnight before serving. Chill metal mixing bowl in the freezer for 5-10 minutes. Using an electric hand mixer, or stand mixer fitted with the whisk attachment, whip all of the ingredients together, starting on low and increasing to high speed, until fluffy, stiff peaks form. 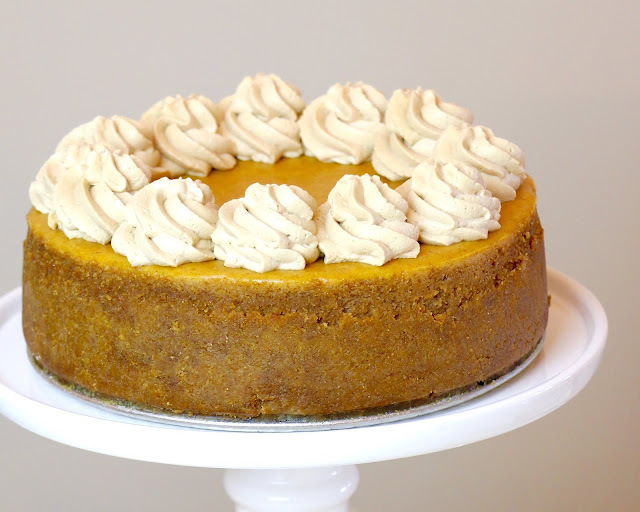 Pipe or dollop into cheesecake just before serving. Cover leftovers with plastic wrap and store in the refrigerator for 3-4 days. Click here to check out my entire Thanksgiving roundup for more fun ideas and recipes!